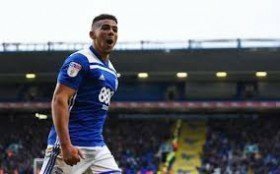 Birmingham City forward Che Adams has reportedly been earmarked as one of the prime targets to bolster the Everton attack during the summer transfer window. Adams has been the Blues' standout player over the course of the current Championship campaign where he has contributed 22 goals and three assists from 40 appearances. As such, there has been plenty of Premier League interest and Football Insider claims that the Toffees are mulling over a potential approach for the 22-year-old marksman. Toffees director of football Marcel Brands has recently revealed the club's ambition to reinforce the squad with young players, and Adams appears to be leading the list of transfer targets. Both Cenk Tosun and Dominic Calvert-Lewin have struggled to score goals on a regular basis for Everton while leading the line this term and Adams could provide a solution to their concerns next term. His potential arrival could trigger the departure of Tosun, though Calvert-Lewin should have a huge future ahead of him after impressing with his hold-up play in the stunning wins over Chelsea and Arsenal of late.